When Ian and Hannah decided to make the move to tiny living, they chose to renovate a school bus into their new home. They planned their renovation project with the same creativity and thoughtfulness that they used to establish their online boutique, Hanzian Designs. The couple took their time to design and build their home just the way they wanted – with a farmhouse style and plenty of storage. They even prepared for the unexpected, which is a good thing. It meant that when baby Nora was born, her beautiful nursery on the bus was ready. 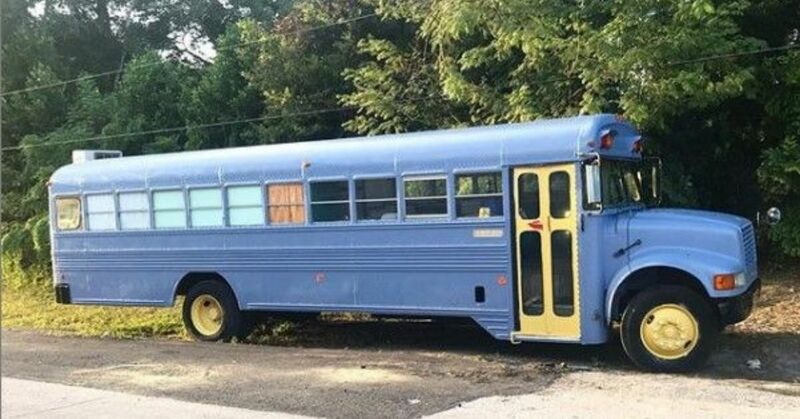 The couple bought this 35-foot International 3800 school bus for $2,000, and as a bonus, it had a working engine and two new tires when they purchased it. Designing a home that is only 186 square feet might have intimidated other people, but Ian and Hannah had some innovative ideas to maximize this space for their growing family. The couple's beautiful home is a reflection of how well they worked together and how well they designed their home before they began. True to their favorite farmhouse style, they added 4-by-8 wainscoting on the ceiling and walls. The white makes the room feel larger, and Hannah knew it would be a nice contrast with the teal cabinets and the matte black kitchen faucet. The comfortable couch slides out to become a full-sized bed. A sliding barn door draws back to reveal one of the prettiest spots on the bus, the custom-tiled shower. Hannah and her mom worked together on this project, and the result is stunning. Hannah knew the tile would add weight to the bus, so they compromised by making choices to lighten the load in other areas. The shower seat lifts up to provide extra storage. The farmhouse sink is one of their favorite features of the home. It fits perfectly in the tiny kitchen and adds to the room's classic style. The black faucet is a handsome contrast with the sink, and together they create a baby bath tub. The faucet can swing out the window to provide an outdoor shower. The lovely gas stove continues the black and white color scheme and has a timeless quality. The butcher block counter sits atop teal cabinets with god hardware that open to reveal ample storage. Hidden inside one of the cabinets is this clever slide-out pantry. It's another example of how the couple designed their kitchen to have plenty of storage and function. The desktop is cut from the same butcher block as the kitchen counter and it is complemented by the mid century modern chair. The teal accent wall matches the kitchen cabinets and provides a striking backdrop for Hannah's decorative baskets, treasures from her thrift store hunts. Another treasure in this room is the topographical map pillow. The map is actually a bandanna the couple found at the Grand Canyon gift shop and later turned into a pillow cover. Here is the exquisite nursery built for little Nora. The crib fits just right in the space, and it's decorated with custom bedding Hannah created. One advantage of tiny living is that the baby is within easy reach for midnight feedings. There's nothing like sharing a special moment with Daddy while you're out on the open road together. As a "bus baby," Nora's first impression of life is filled with adventure, travel and the comfort of home. She will never forget the memories she made in the special home her parents lovingly created for their family.